← RP: What are the odds?! 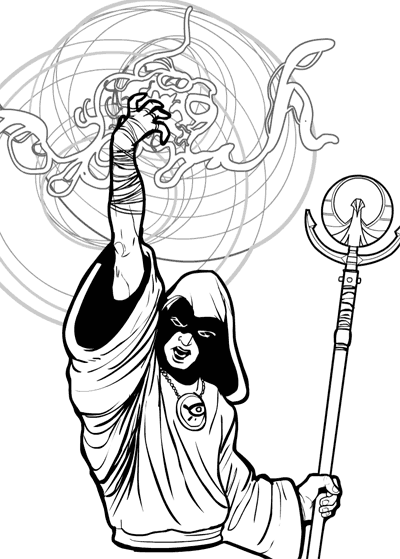 b) all of the relevant bits in this particular sketch of the day ARE from HM3 — both spell effects on the hand are from ItemRightEnergy, and the staff head is from ItemRightPolearms. Furthemore, there are several hoods and robes in the program already, too. And a couple of sashes. And more than a couple of polearm shafts. And wraps for the arms in Gloves. And hands galore in Hands. Every single bit in this particular illustration is either literally cut-and-pasted from already-existing HM3 items, or exists in essentially a very VERY similar form already. So not only is saying “put this piece in HM3” on every single SOD post missing the point, but IF you are going to say that, at least know what’s already in there and what is not. That’s particularly ironic when, as in this case, the items are literally copy and pastes of stuff that’s ALREADY THERE. I have to say, Jeff, that this is your best piece to date. Great work on this one, keep it up. Well said, Jeff. It is a great pic, too! I like how the eyes and brows, cast in shadow, stand out by using the white lines. I think it’s very cool. Just an idea for the character contests: Since 90% of what i have seen in the SOD’s comes from Heromachine 3 Alpha why not have a contests to see who comes the closest to one of the weeks SOD’s. If this idea has already been posted i apologize. If this is a rather mundane or idiotic idea i also apologize. If I remember correctly, there were plans for a Jewlery section right (earrings, necklaces, rings, piercings, bracelets etc.. )? Is that still going to happen? There won’t be a jewelry slot (like Head, Body, Headgear, etc.) but rather at some point I’ll have a set of Jewelry in various appropriate places (Ears and Neckwear, probably).